Photography arrived in India as early as 1840, followed by the establishment of photographic societies in the presidency states of Calcutta (Kolkata), Bombay (Mumbai) and Madras (Chennai) by the mid-1850s. 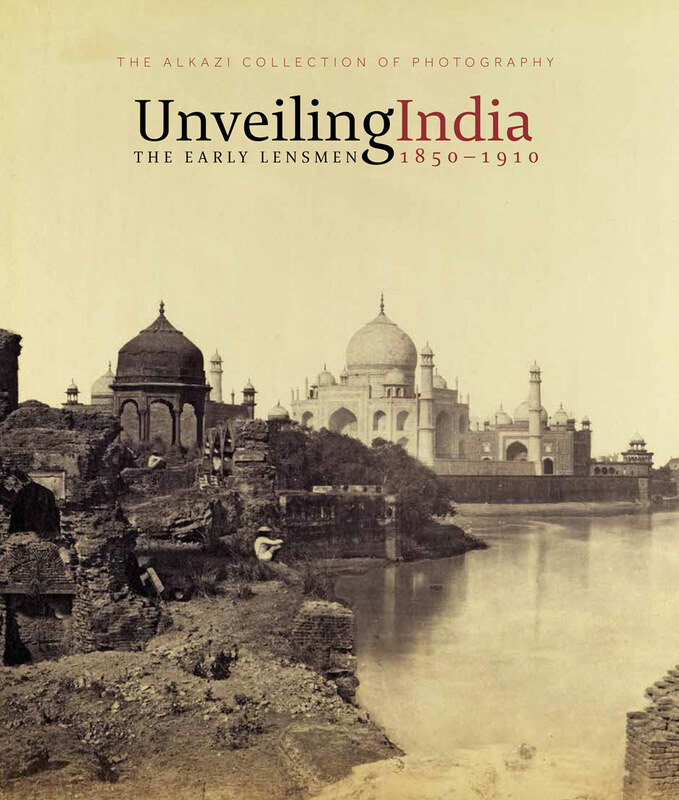 Drawn from the Alkazi Collection of Photography (New Delhi), this exhibition catalogue brought out in conjunction with the exhibition of the same name presents an array of early vintage works that underscore distinct aspects of architecture, landscape, and people photography. Bringing forth the syncretic culture of some of India’s heritage sites, the volume explores the work of two army-men in the service of the English East India Company: Alexander Greenlaw (1818–1870) in South India, and John Murray (1809–1898), a Scottish-born doctor, stationed near Agra in the northern state of Uttar Pradesh. They both take some of the earliest landscape photographs, at times establishing a visual lineage with the picturesque tradition—topographic imagery suffused with ruins—derivative of English painting. Gradually, India witnesses the rise of sophisticated photostudios in some of the leading metropolitan centres, pandering to the shifting tastes of the public. With rising trade alliances and cultural exchanges, a professional class of photographers emerges, such as Samuel Bourne (1843–1912) of England, and Raja Deen Dayal (1844–1905), India’s renowned court photographer. They continue and refine the tradition of ‘survey’ photography, expanding their oeuvre with princely patrons as well as the emerging professional classes. The expansive cityscape with its varied dwellers then leads to another modern form of modern imagery—that of the street— circulated internationally through the private album as well as the postcard, and through these formats, India is revealed to a global audience. The two lead essays provide various perspectives on the pictorial traditions and the documentation process of the landscape and the cities of India. Through a vast tapestry of images, India emerges as a land which struck the imagination of the visitor not only for its history, but also for its ability to adapt to the times, especially through the global networking of images that today constitute a heritage and a legacy. Rahaab Allana is the Curator of Alkazi Foundation for the Arts and Fellow of the Royal Asiatic Society (London). He is the author of Inherited Spaces, Inhabited Places (a volume on World Heritage Sites, 2005) and guest editor of Marg Volume 61: Aperture and Identity—Early Photography in India (2009) as well as the Lalit Kala Contemporary Journal titled Depth of Field: Photography as Art and Practice in India (2012). He is also the honorary editor and proprietor of India’s first theme-based photography quarterly titled PIX, the next issue of which is titled Embody: The Gender Issue. Davy Depelchin is a researcher at the Royal Museums of Fine Arts of Belgium, where he is responsible for the federal research programme on 19th-century Orientalism. In this context, and in association with Ghent University, he is preparing a doctoral thesis on the dissemination of the orientalist praxis in Belgian artistic circles from 1830 to 1914. Depelchin has co-curated the traveling exhibition From Delacroix to Kandinsky, Orientalism in Europe (Brussels, Munich, Marseille; 2010-2011), co-edited the accompanying catalogues and presented papers at a large number of international conferences and symposia.